This post is the third corrective exercise in a series I am doing for Personal Fitness Professional Magazine in my online column titled “Functionally Fit.” To read more online exercise tips, visit www.fit-pro.com. The hurdle step assessment (as part of the FMS) is designed to challenge the body’s proper stepping and stride mechanics as well as stability & control in single leg stance. 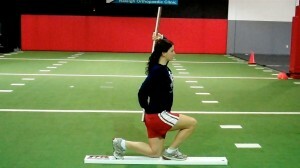 The step leg must perform ankle DF and hip/knee flexion while core stability must be present in single leg stance. Limited hip mobility and/or poor hip and core stability restricts natural movement and leads to compensatory motion often in the form of unwanted hip rotation, hip hiking, trunk sway in the frontal and sagittal plane. A common corrective exercise prescribed to improve core stability is a standing march (single leg stance) with straight arm pulling to engage the core. Execution: Begin standing with the feet together while holding the cable handles with the palms down. Select a weight that provides ample enough resistance to maintain isometric shoulder extension for 30-60 seconds. Be careful not to select too little or too much weight as this will disrupt the execution of the exercise. Next, pull the arms down toward the side and hold in that position. Maintaining an erect posture, slowly lift the left leg up (ankle dorsiflexion with knee and hip flexion) and pause for 2-3 seconds. Move the unsupported leg back to the start position but keep the arms actively extended. Repeat this sequence for 10 times on the left leg. Rest for 30-60 seconds and then repeat on the other leg. Perform 2 sets. Additional notes: I tend to focus on unilateral consecutive repetitions (as described above) especially if there is a 2/1 asymmetry with the hurdle step. As the asymmetry is resolving, I will progress to a reciprocal pattern as this is more natural in life/sport. If a cable column is unavailable, alternate methods include using a suspension training apparatus or resistance tubing anchored high enough to accomplish the same upper body isometric pulling. Application: Poor hip stability and control in single leg stance is a common cause of overuse injuries in runners and contributes to increased risk for anterior knee pain and ACL injuries. Keep in mind that poor performance on the hurdle step movement can be related to weak hip flexors on the stepping leg, tight hip flexors on the stance leg, diminished hip stability and poor balance. It is critical to assess the whole movement prior to assuming that there is just one problem or weak link in the kinetic chain. Restoring symmetric, optimal stepping patterns will promote proper hip disassociation, as well as training the body to synergistically activate core and hip musculature to demonstrate optimal single leg stability in unilateral stance. The FMS is a great tool to uncover asymmetry and movement dysfunction in fitness clients as well as patients in the clinic who are ready to transition back to sport. I have been using this tool consistently for 2.5 years in my practice. One of the questions I have asked myself about the screening tool is how reliable is it? Click here for an earlier post I wrote on this topic regarding what it tells us as practitioners. One of the challenges with any screen or test is not only validity but reliability. In the April edition of the Journal of Strength and Conditioning Research, we gain some new insight regarding intra and interrater reliability via 2 new articles. The first article discusses a controlled laboratory study where repeated measures were used to investigate how experience using the FMS and clinical experience as an athletic trainer (AT) affects the intrarater reliability of FMS testing. The raters (17 men and 21 women who were recruited from the university’s athletic training clinical staff and academic programs), with different levels of FMS and clinical experience (AT students, AT or AT with at least 6 months experience using the FMS) viewed each of the 3 videotaped models. None of the AT students or AT members had seen or used the FMS previously compared to the AT group with at least 6 months of experience. Each group rated the models on each of the FMS exercises according to the script presented by the lead investigator. A week later the raters watched the same videos again in a different randomized order and rated each model on each exercise. The intersession scores were examined to establish intrarater reliability of all participants. In addition, the intrarater reliability of different groups of participants (students and clinicians) was compared to infer differences about the influence of clinical experience as an AT along with previous experience using the FMS. Click here to read the abstract on this article.